Zurich, Switzerland, September 20, 2018 – This morning, leaving the tranquillity of Darmstadt, where the bicycle is a favoured mode of transport, His Holiness the Dalai Lama was driven rapidly to Heidelberg. Reaching this picturesque city on the River Neckar he was taken directly to the City Hall where he was received by Mayor Wolfgang Erichson. After greeting well-wishers gathered on the pavement, His Holiness turned to wave to people watching from surrounding windows. Inside City Hall His Holiness was given an official welcome and invited to sign the Golden Book inscribed by honoured visitors to the city. This was followed by an exchange of gifts. As His Holiness entered the auditorium and took the stage he received warm applause from the 1500 people in the audience. In his welcoming speech Mayor Wolfgang Erichson extolled the virtues of the beautiful city of Heidelberg. The University of Heidelberg attracts an open-minded student body and is among the 50 top universities in the world. People from 160 nations live in the city, which sees diversity not as a threat but an asset. The Mayor noted that it is possible to learn how cultivate and achieve happiness and he was pleased to report that at least one pioneering school in the city is teaching just that. During a short musical interlude a wind and string quintet played a delightful piece by Mozart. Director of the German American Institute, Jakob Kollhofer told His Holiness it was a great honour to welcome him to Heidelberg, describing him as living reminder of peace and compassion, known for his warm smile. He observed that His Holiness has been a refugee for 60 years during which time his appearance and conduct have been consistent. 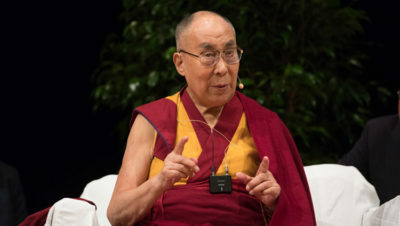 Welcoming him to a festival of science in what has come to be known as a city of science, Kollhofer invited His Holiness to share his thoughts about happiness and responsibility. “Good morning, dear brothers and sisters. I make a point of clarifying that the 7 billion human beings living on this planet today are emotionally, mentally and physically the same. We all want to live a happy life and don’t want to suffer. We have a marvellous brain which is very helpful when it comes to analysing and investigating reality. Our intelligence can bring us peace of mind, or it can destroy it. Using our intelligence to understand moral principles we can learn to cultivate warm-heartedness and infinite altruism. “As scientists have discovered, basic human nature is compassionate. Our mother gave birth to us, then cared for us with maximum affection. If she’d neglected us instead, we would likely have died. “Anger and fear undermine our immune system, while warm-heartedness brings peace of mind. Therefore, just as we teach children to comply with physical hygiene for the good of their health, we should also counsel them in a kind of hygiene of the emotions. If they are to be both physically and mentally fit, they need to know how to tackle negative emotions and maintain their peace of mind. And to tackle the emotions it’s useful to have something like a map of the emotions, a map of the mind. “This is something we can learn from research conducted in ancient India through meditative practices to cultivate single-pointed concentration and analysis. The Buddha practised both, and although these practices are described in religious literature, they can be examined and employed in an academic context. “I am a student of such ancient Indian knowledge as preserved in the Nalanda Tradition, which relies on reason and logic. The great Nalanda scholar Shantarakshita, who was invited to Tibet by the Emperor in the 8th century, established a mode of Buddhist training and practice in which reason and logic play an integral part. Kollhofer introduced three scientists to take part in discussions with His Holiness this morning—neurobiologist Dr Hannah Monyer, gerontologist Dr Andreas Kruse, and astrophysicist Dr Matthias Bartelman. 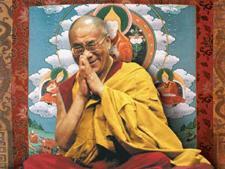 “We are intelligent,” His Holiness replied, “we have seed of compassion from birth. Using reason and intelligence we can enhance our sense of compassion and come to understand how its opposite, anger, is harmful. Our biological compassionate instincts tend to be coloured by attachment. Such a biased attitude cannot be transformed into great compassion. That’s why we first develop equanimity. We can learn to extend loving kindness to the whole of humanity. “That’s a dualistic view,” was Dr Monyer’s response. Dr Matthias Bartelman asked if humility was important in the study of science. His Holiness answered “Yes”, and went on to discuss how we are all dependent on others; we depend on the community in which we live. Gerontologist Dr Andreas Kruse told His Holiness he had three questions for him. “Do you think that the link between happiness and responsibility is meaning. His Holiness retorted that this sounded like a philosophical question like ‘why are we here?’ he said the religious answer would either be because it’s God’s will or because of karma. Dr Kruse reported findings that older people derive meaning from being able to take care of younger members of the family. However, when they suffer degenerative conditions, such as dementia, they are excluded from such activities and younger people feel a responsibility to take care of them. Dr Kruse raised the notion of ‘border situations’ first mooted by Karl Jaspers a German-Swiss psychiatrist and philosopher educated at Heidelberg. Answering questions from the public His Holiness touched on the need to ensure that the 21st century does not repeat the experience of the 20th century, which was overwhelmingly violent. The 21st century should be an era of dialogue. Problems should be solved by talking them over, not through the use of force. Challenged to say why he had not intervened in the Rohingya crisis in Burma, he replied that he is an outsider to that conflict. He reported having spoken and written to Aung San Suu Kyi, who could have done more. He counselled Burmese Buddhists when moved by anger to recall the face of the Buddha. His Holiness was invited to lunch in the vaulted foyer of the City Hall at the end of which he drove to Mannheim from where he flew to Zurich. Tibetans had mounted a traditional welcome outside the hotel, whose driveway was lined with Tibetan flags. There were Tashi Shölpa dancers and Tibetan youngsters offering the ‘Chema Changpu’. His Holiness interacted with all who had come to greet him, happily spotting several old friends among them. In the lobby he was greeted by the Abbot, President, and Director of the Tibet Institute Rikon as well as other monks and Lamas.